Supplementary material reads: "Rogers & Cowan, Inc., CR 54581. He digs jazz. 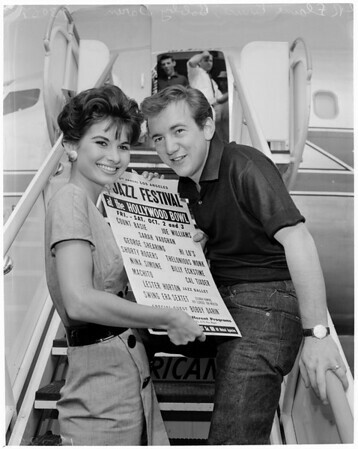 Singer Bobby Darin is met at L.A. International Airport by 'Miss L.A. Jazz', Elaine Bruce, who shows him a sample of the posters for the first Los Angeles Jazz Festival, to be held at the Hollywood Bowl Friday and Saturday nights. Darin, who will appear at the festival as 'special guest star', arrived here this morning from nightclub engagements in the East. The 22-year-old singer's current hit record, 'Mack the Knife', is the number one selling tune in the nation."